The hot new Nintendo Switch is the most versatile video game console of all time, obviously. There have been other solutions in the past like the TurboGrafx16 and TurboExpress that were able to play the same games on home and portable consoles, but it has never been this convenient to play on the same console whether you’re at home or on the go. Of course, there are still a few accessories that make the portable aspect of the Switch even better, such as a stand that will prop up your console much better than the flimsy built-in kickstand. Another must-have for Nintendo Switch gaming on the go is the iBOLT Nintendo Switch Headrest Mount, which makes it easy to attach your Switch to the headrest in your car so your kids (or anyone else) can play anytime, anywhere. The iBOLT switch headrest mount is the perfect backseat entertainment for your guests. The mount is made out of sturdy aluminum and expands to the center of your front seats. Easy to install and folds away when it is not in use. Play games against your fiercest opponents, watch movies, and entertain your backseat companions on a long road trip. 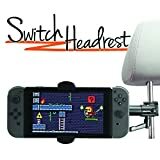 Compatibility: designed for the Nintendo Switch, this headrest mount will also fit most smartphones and case combinations from 2. 7″-5″ wide. iPhone 6 /6s / 6s plus / 7 / 7 plus, samsung galaxy s7 / s6 / s5 / note 5 / note 4, sony, nexus, google smartphones, and sony psp / psp 3000 gaming consoles. Functionality: the ibolt switch headrest is easy to install and is a safe and secure way to provide eye level back seat entertainment with your nintendo switch, smartphone, or sony psp gaming device. Easy one hand insertion: easy to insert your phone or nintendo switch, and leaves all ports and buttons uncovered. Press the spring-loaded latch to the right or left when inserting vertically and turn cradle and push the latch up or down to insert horizontally. Adjustable: the 10 inch aluminum headrest mount is adjustable for optimal viewing positions. The holder can tilt and rotate 360 degrees so you can get the best gaming experience. The mount can rest between the center of your 2 front seats and can fold away when its not in use.